DO NOT use Z shaped aluminum brackets that are pop riveted onto your roof, water will get through the hole you make in the roof and it will rust your roof and interior out in a couple of years. This is the NO LEAK seven piece solar panel mounting kit for vehicles. You use it to mount a single panel up to 300w size onto your vehicle roof or wall. The only hole you need to make (if you are routing the solar cable through the roof) is protected by a IP67 water proof cable entry housing (2 cable entry glands) ensuring that it is impossible for water to enter in through roof and damage your vehicle. 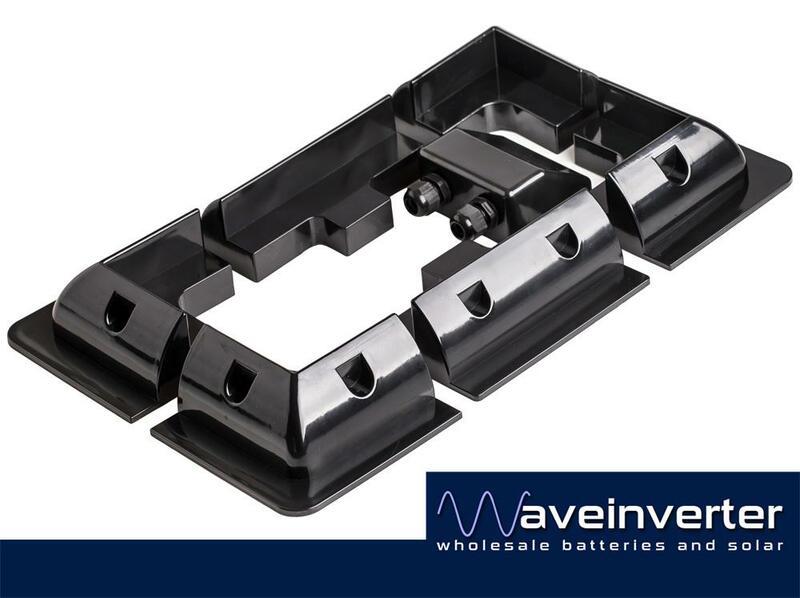 These unbreakable ABS plastic mounts are secured to the surface using an adhesive such as Sikaflex. The mounts will support the solar panel at the correct height above the surface to enable the flow of air underneath the panel and keep it cool, ensuring the solar panel functions at it’s optimum. The panel is secured by screwing or bolting it to the mounting corners and sides. 4 x Corner mounts 15cm x 15cm x 6cm.